How and why do electrons flow in a metal conductor? In this simulation, electrons are added to the right side of the thin metal plate. These surface electrons create an electric field that pushes the electrons inside the metal to the left. Eventually the surface charge on both sides balance and the electron current stops flowing. 1. Electrons are small and bounce off of metal ions. 2. 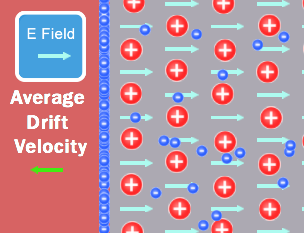 Electrons are pushed by an electric field created by the surface charges on the left and right side. 3. The net charge inside the conductor is always zero. A big “Thank You!” goes out to Professor Bruce Sherwood for his help on this simulation!